New Page Books, 9781632650016, 320pp. The Aztec UFO Incident--the first ever widely publicized report of a recovered flying saucer--was derided as a hoax for decades. But now the Ramseys and Frank Thayer reveal the exact spot where the craft landed and show how the 100-foot diameter saucer was moved to a secret laboratory. Witnesses to the incident who were interviewed by the authors affirm that they were sworn to secrecy by the military. The authors also reveal the names of scientists who worked on the craft after its recovery. Suzanne Ramsey's family lived in the Four Corners area, and Suzanne owned a small business there, pursuing media writing and hosting a radio show. She met and married Scott Ramsey after he appeared on her show to discuss his research. Suzanne has traveled extensively, interviewing and pursuing research in university and USAF archives. "There is no question that an intelligently controlled extraterrestrial spacecraft was recovered by agents of the government of the United States near Aztec, New Mexico, in March 1948, and taken for classified study and evaluation. This is a fascinating and carefully done exposé well worth reading." "An excellent read with powerful information." 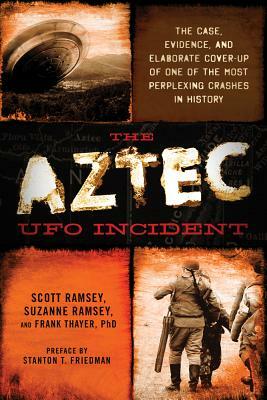 "The authors have done a superlative job documenting the crash and recovery of an alien spacecraft in Aztec, New Mexico, in March 1948. Their three decades of investigation, supported by countless interviews and more than 55,000 pieces of documentation, leaves no doubt that a disc was recovered by the U.S. Government. This is a compelling book that should be read by anyone interested in the UFO phenomenon, and in what our government knows about the alien visitation of our planet!"